Ashley Arnett earned her J.D. in 2014 from Loyola Law School with a concentration in Civil Litigation in Advocacy after receiving a B.A. in Global Studies from the University of California, Santa Barbara with honors. Ashley focuses her practice on protecting the rights of consumers and victims of wildland fires, tobacco companies, as well as victims of serious personal injuries, financial loss and/or wrongful death. 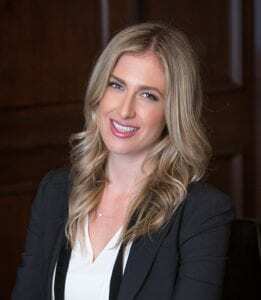 Ashley is an active member of the Consumer Attorneys of California, Consumer Attorneys Association of Los Angeles, Beverly Hills Bar Association and American Bar Association. Ashley is admitted to practice law in the state of California and before the United States District Court for the Central District of California. Loyola Law School, Los Angeles, CA, 2014, J.D. University of California, Santa Barbara, CA, 2009, B.A.